Bill Steele lives in the former Dorchester jail and is inviting strangers to experience it too. If you find yourself in a small New Brunswick village and are looking for a cheap place to lay your head, there's always the old Dorchester jail. For just $34 a night, you can live like an inmate in a former jail cell. Except instead of a warden, this prison has a friendly host who brings you toast and coffee in the morning. Bill Steele bought the old Dorchester, N.B. provincial jail in March and has turned it into a unique Airbnb that he also lives in. He officially started accepting guests last week and says people have contacted him from across Canada. "Everybody that has stayed so far has loved it to death," he told HuffPost Canada. The village of Dorchester is a half-hour drive outside of Moncton. Steele says he's already known in the area. "People in Moncton call me the jail guy," he says. The building is more than 200 years old but only closed 20 years ago, according to CTV Atlantic. 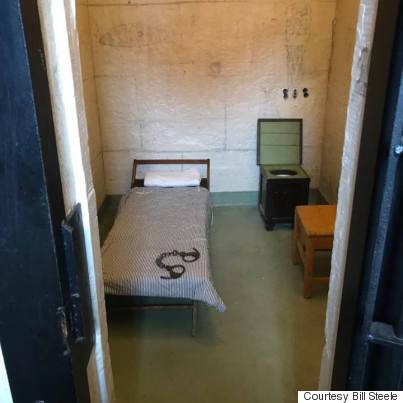 While Steele has added some perks like new beds, Wi-Fi, dimmable LED lighting and optional privacy curtains to cover the cell doors, it's still a creepy old jail. "You're getting a bare bones prisoner treatment," he told HuffPost. There is no heating or air conditioning in the cells. Graffiti from former inmates is still on the walls. The $34 gets one person a stay in a single bed. He charges $5 extra for a second person to share the cell. Larger rooms or even the whole building can be booked for events. There is also a gym available for $5 a day. Steele has opened seven rooms so far for guests, and hopes to open more soon. He also has several ideas to make the stay more interesting. He's trying to get in touch with Bernard Robichaud, who plays Cyrus on the "Trailer Park Boys," to ferry people who are flying in to their lodgings. As an antique collector, he also owns some "morbid and unusual things" that he wants to display for his guests, including a 1940s-era hospital gurney that he says was used on the set of a horror movie. Not creepy. Not at all. "I have some human skulls, and an old tombstone that's popped up on the front lawn," he says. He says he believes that the place is haunted, but doesn't think the spirits have any ill intentions. "I'm a chickenshit, believe me," he says. "I can walk around at 3 o'clock in the morning... And I don't feel scared." If any place is haunted, it might be the jail — New Brunswick's final double hanging took place there in 1936, according to CBC News. Brothers Arthur and Daniel Bannister, who were 17 and 20 years old, were hanged for murder and buried in a pine box behind the building. Even though their grave is unmarked, Steele says he's pretty sure he knows where it is. He wants to set up a memorial for them. The 50-year-old recently experienced a tragedy of his own. His only son, Billy, died in March at age 25 after his body rejected a heart transplant. Bill Steele and his son Billy. "I was going to surprise him with the jail, to tell you the truth," he says. Steele had sent Billy a Facebook message to let him know he'd just bought it, but he never saw it. He quit his job as a City of Toronto garbage worker and sold his house to buy the jail and move out to New Brunswick. He had wanted to relocate to the Maritimes, and was looking for a unique property when he came across the jail. He sees his move and new venture as a tribute to all of the people he knows that never got to follow their dreams. He spoke to HuffPost Canada while on a hike, looking out at the Bay of Fundy. "I pulled it [off], I bought a damn jail, I am the happiest person in the damn world," he says. "Even with my son's loss, I did something I wanted to do."